Countless singles have professed their love for pizza on their dating profiles. But would they trust a purveyor of pizza to find their perfect romantic match? That may soon be an option for singles in the Netherlands, where Domino’s Pizza has revealed plans to launch a branded dating app. Domino’s chief executive Don Meij announced the upcoming app, which will match customers according to their favorite toppings, at the company's general meeting in Brisbane in early November 2018. Little is known about the design or functionality of the app so far. Like many of its contemporaries, it will reportedly have a swipe-based matching system. However, unlike Tinder or Bumble, users of the Domino’s app will not swipe on each other’s profiles. Instead, they will swipe to indicate approval or disapproval of specific pizza toppings. The algorithm will then match them with members who have similar tastes. Don’t be surprised if there’s also an option to order pizza delivery directly from within the dating app (what else would pizza lovers eat on their first date?). Meji also plugged Pizza Checker, another high-tech Domino’s experiment set to roll out in the first quarter of next year. Pizza Checker is an AI-based quality control system that will use a camera installed over the prep bench to identify pizza type, correct toppings, topping distribution, crust type, and temperature. The device will report back in seconds, providing customers with an image of their pizza on the bench and letting the store manager know if a subpar pie needs to be remade. 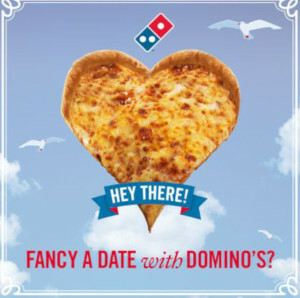 The validity of basing compatibility on pizza preferences is obviously up for debate, but Domino’s is not the first food company to venture into the dating industry. In 2015, Oscar Mayer launched Sizzl, a dating app for bacon lovers. Other apps have launched for vegetarians, gluten-free singles, paleo singles, and burrito lovers. For general foodies, there’s PB&J, Suppr, Dindr, Dine, and HiDine. Love at first sight may be a stretch, but that won’t stop companies from trying to spark love at first bite.